Royal Caribbean’s Sunshine Project = Quantum Class | TRAVEL-rrific! 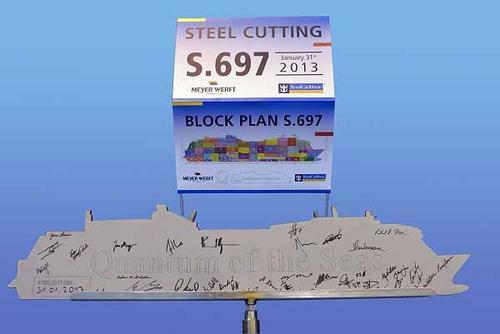 Well it has finally been revealed…Royal Caribbean’s long awaiting Sunshine Project – The new Quantum Class of Ships! This is a follow-up to my earlier post Sunshine Project. Royal Caribbean will be launching 2 new ships the Quantum of the Seas and the Anthem of the Seas. They will debut in the fall of 2014 and the spring of 2015, respectively. These ships will be smaller than the enormous Oasis Class and will only hold 4100 passengers vs. 5400 passengers. Royal Caribbean is going to bring in all of their world class entertainment and amenities for this class of ship. Going with the premise – smaller might be better! « Italy Trip – For Women Only!